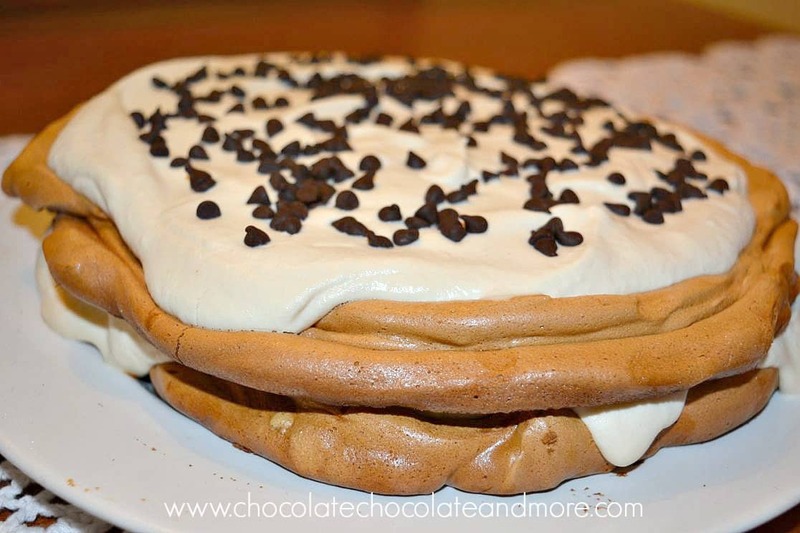 Tiramisu Pavlova - Chocolate Chocolate and More! 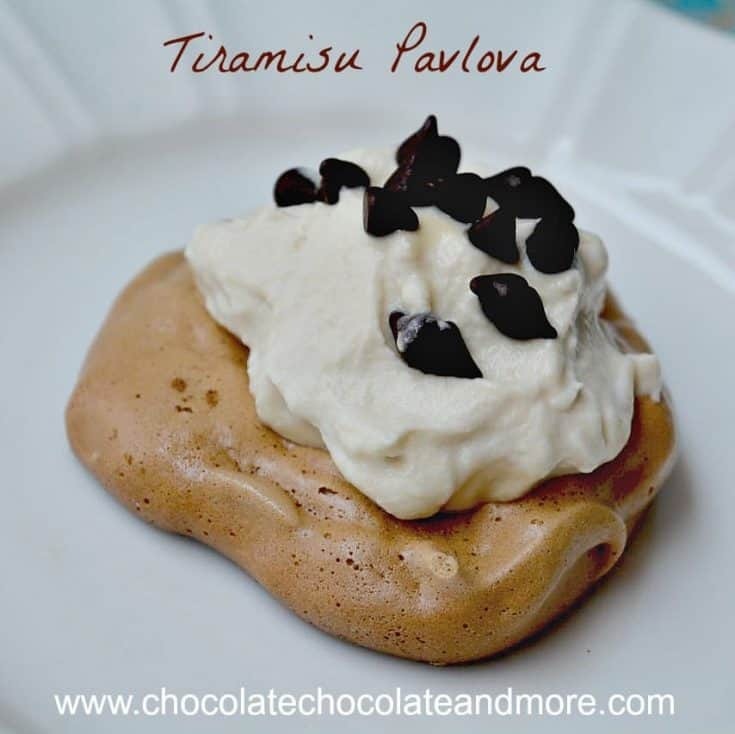 Coffee flavored meringue and kahlua marscapone filling gives Tiramisu Pavlova the flavor of a cappuccino in dessert form. One of the great things about a Fulbright is meeting the other Fulbrighters. I recently went to a conference Jakarta where I met Martha, a Fulbright law professor in Myanmar. Turns out Martha is a great cook and she told me her secret for an incredible strawberry pavlova – brown sugar in the meringue. I’ll work that out for a post later. I’ve been wanting to make a pavlova for a while but my oven in Phnom Penh is unpredictable to say the least. Instead of a thermostat with temperatures, it’s got a scale of 1-10 for gas levels. You have to watch the temperature like a hawk. Sometimes it’s hard to get the oven to heat up, other times it sky rockets. My first attempt at Tiramisu Pavlova was less than satisfying. I tried making three large meringues. The oven wouldn’t hold a low temperature for the meringues and even at the lowest setting (1/2), it soared to over 500°F. Needless to say, my meringues were less than perfect. They tasted great so I know I go the ingredients right. They just looked pretty pathetic (see my photo below). I decided to modify the recipe a bit and make small meringues instead of three large ones. I can cook the smaller meringues in less time and they’re easier to serve. Of course small is a relative term. I’m from Texas so I used large soup spoons put generous spoonfuls of meringue on my baking sheet. The first batch I made used marscapone for the filling. The second time I made them there was no marscapone to be had. It’s like that here in Phnom Penh. You sometimes have to wait months for a container ship to arrive with imported products. So, I made the second batch with cream cheese and it worked well. I’ve also provided modifications for those who want to avoid alcohol in their desserts. 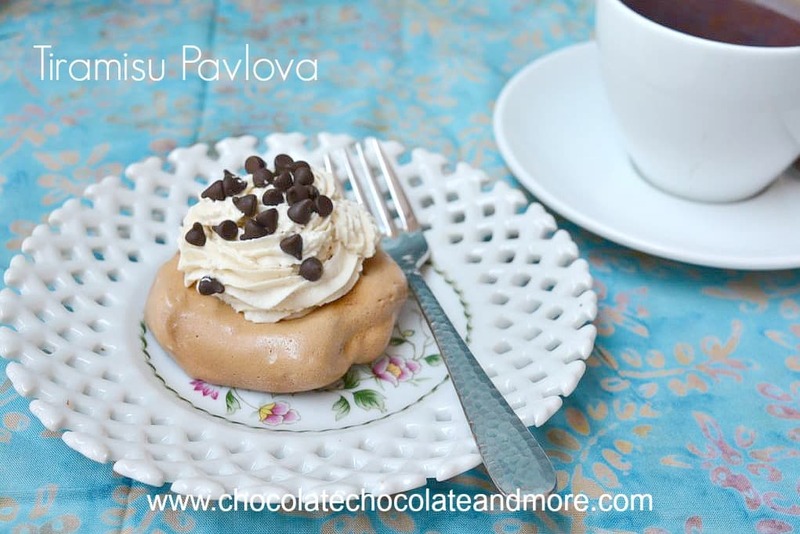 Tiramisu pavlovas are an elegant dessert or a great accompaniment for afternoon tea. Beat egg whites on high speed until soft peaks form. Beat in coffee powder. Gradually beat in brown sugar until stiff peaks form. Line a baking sheet with parchment paper. Use large soup spoons to spoon meringue onto parchment paper. I put a heaping spoonful of meringue and used the other spoon to make a dent in the middle and smooth the edges. My meringues were about 3" in diameter and about 1" high around the edges. Bake at 250°F for 1 hour. The meringues should be dry. Cool on a rack. (meringues can be frozen). Put whipping cream in a cold bowl (I put my bowl and beaters in the freezer for an hour). Whip on high speed until stiff peaks form. 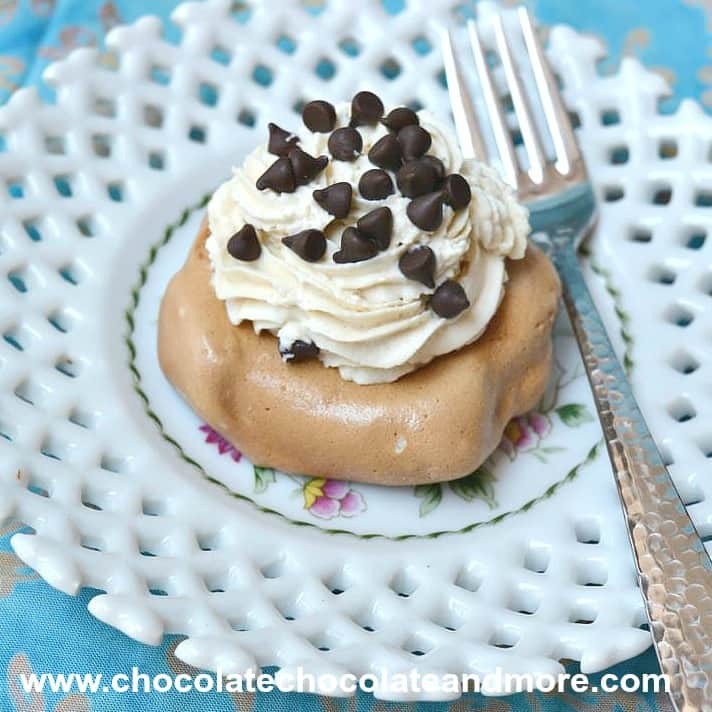 In a separate bowl, whip Kahlua and marscapone together until soft. Fold in whipped cream. 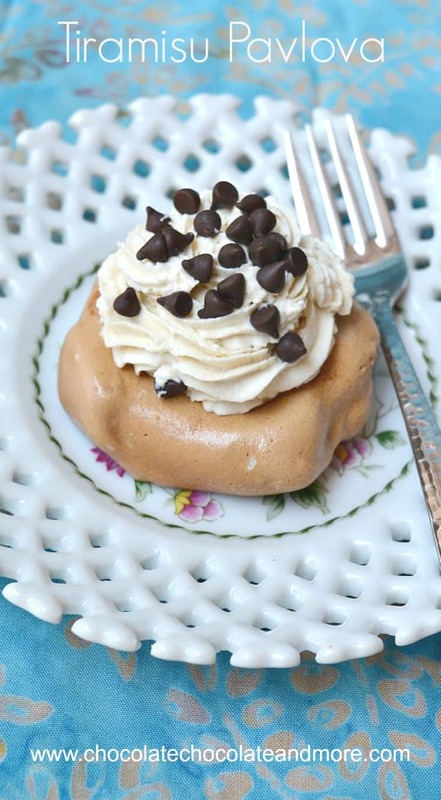 Spoon filling into meringues and sprinkle mini chocolate chips on top. Refrigerate until ready to serve. These are best served the same day but they can be frozen. If you like this pavlova, you might also want to try this beautiful chocolate pavlova with nutella and strawberries from Love Swah. Or if you want to just stick with meringues, try these. Or if you’d like a different twist on tiramisu, try these maple bourbon tiramisu parfaits from Beyond Frosting. Or a traditional tiramisu from A Treats Affair.